There’s nothing like escaping away to a hotel for a weekend or during the holidays! 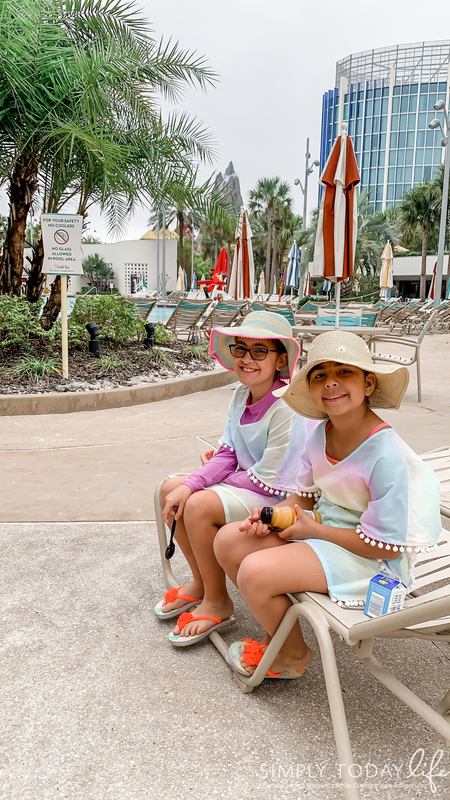 We love going on vacation adventures and we love theme park thrills, but this mom especially loves being able to enjoy the resort we are staying on. That’s why I fell in love with Cabana Bay Beach Resort located in Orlando Florida. It had everything our family mostly loves about a resort. Thank you, Cabana Bay Beach Resort for inviting me and my family to come and play! All opinions are my own! Post contains affiliate links. 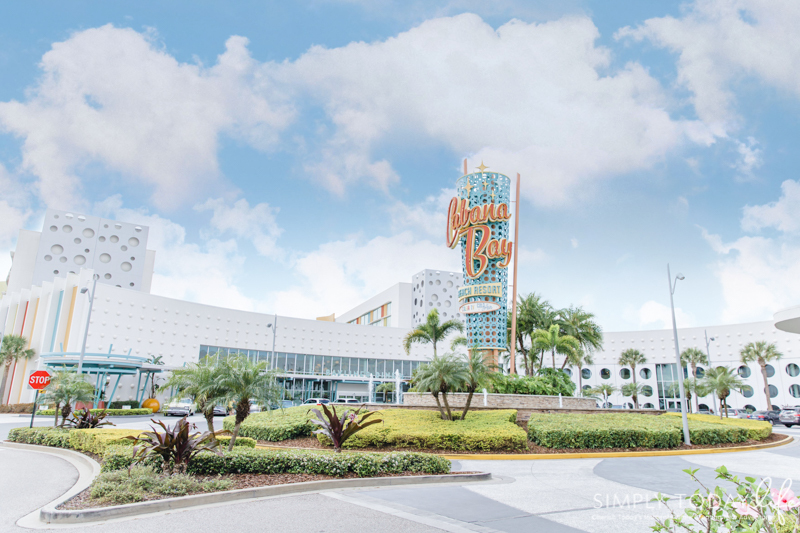 Why Stay At Cabana Bay Beach Resort? 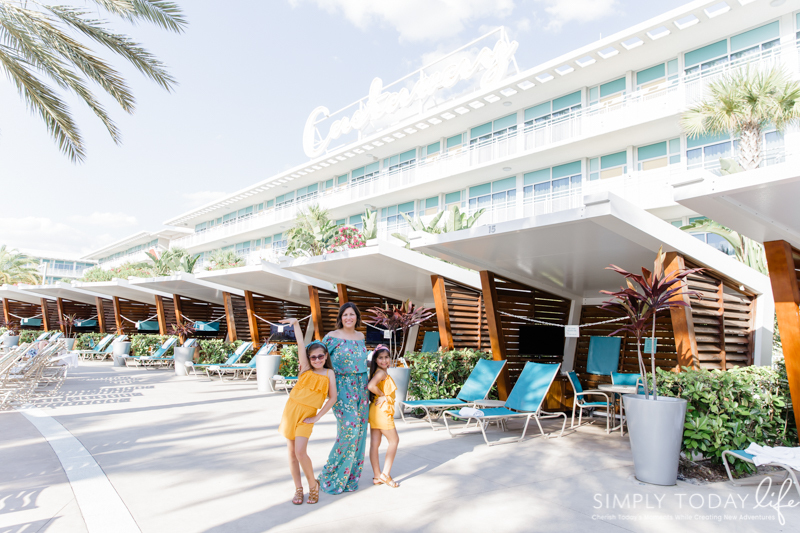 There are so many reasons why staying at Cabana Bay Beach Resort will make it an amazing vacation for your family, but I’m going to share some of our favorite reasons we loved the hotel. Keep reading for details on all of these amenities! As a family of four, we’re pretty easy to accommodate in a hotel. Although, we do rather have more space than less. One of the worse things about staying in a small room is the fact that you never want to hang out in the resort. 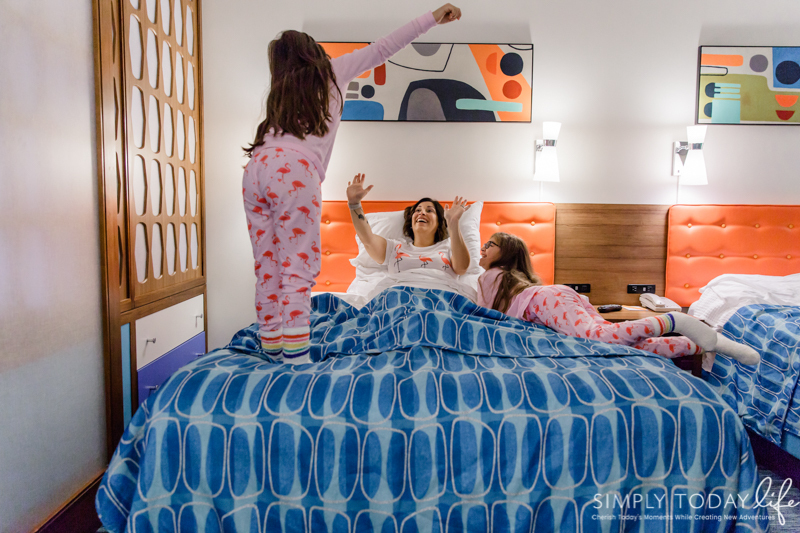 Well, with how spacious the Cabana Bay Resort rooms are, you’re going to want to spend time in the room and exploring the resort. Florida residents I even have a sweet deal for you and your family! 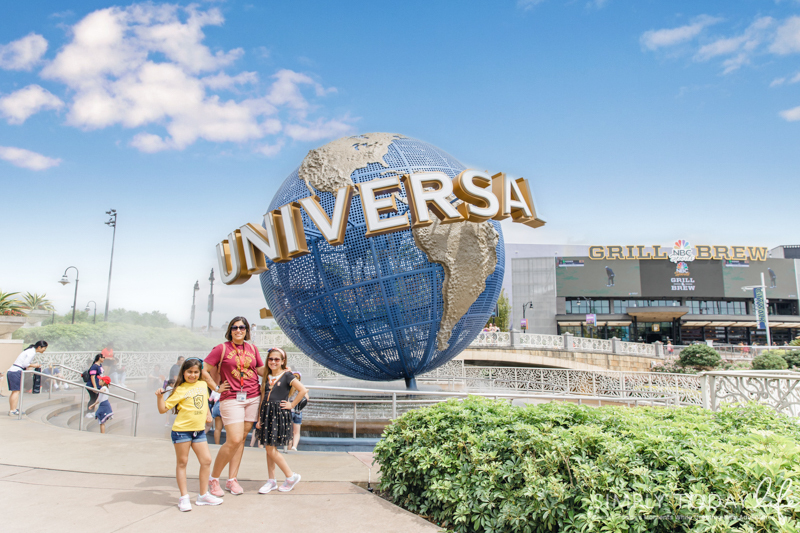 Make sure to visit the Universal Orlando Resort site for some great deals for Florida residents. Check out all the details! Believe me, you want to take your family asap! It makes the perfect staycation spot you won’t want to leave! 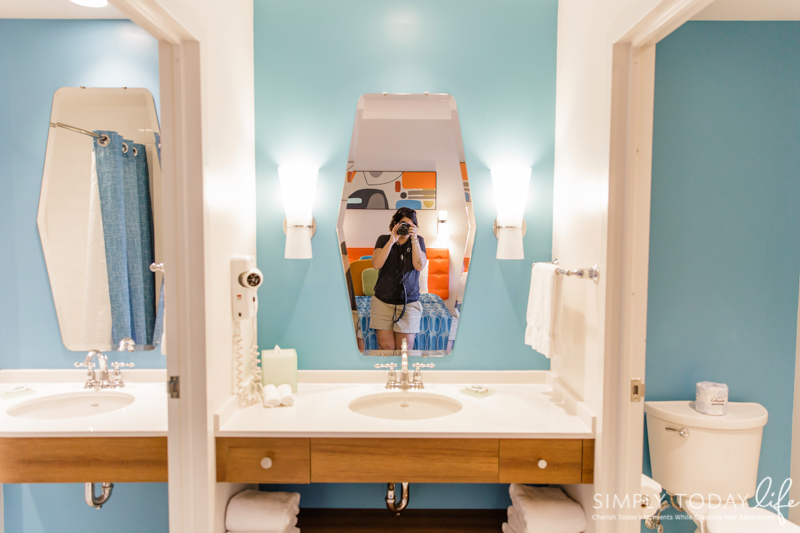 I loved that the family suites at Cabana Bay include large bathrooms where several people can get dressed at the same time. You can see from the photo above we had a sink with a shower on the left, sing area with a hairdryer, towels in the middle, and toilet with its own door on the right side. 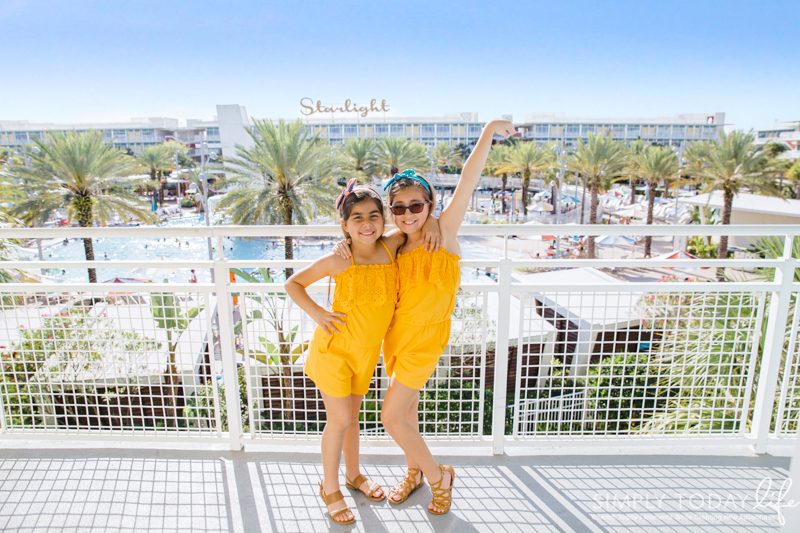 My girls loved all the bright colors and the retro decor in the entire resort! I love how the little details like the Zest soap and the VO5 hair shampoo and conditioner just tie the entire theme together! There’s also a walk-in closet which is perfect for storing suitcases, hanging your clothes, and keeping the kids messes out of the way! That was a huge plus! As a mom of two young girls having a kitchenette in our suite is one of the best amenities a resort can add. It’s the perfect place to fill the mini fridge with drinks and snacks for the family! 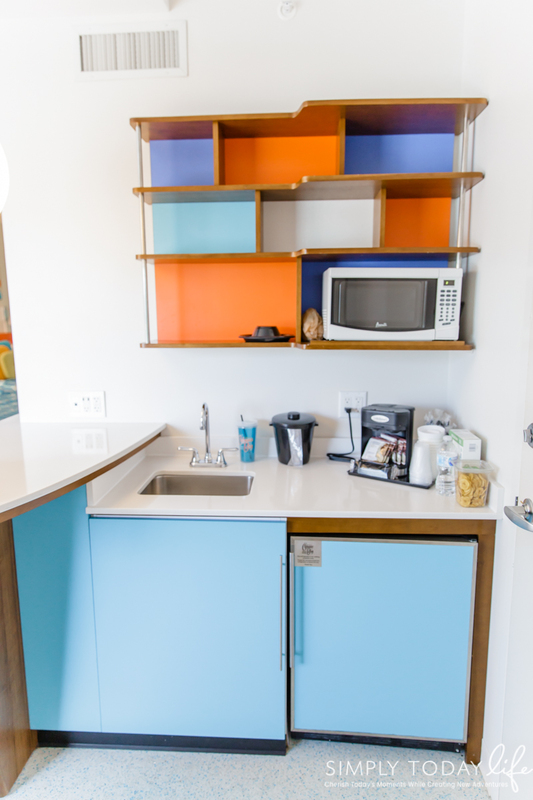 Plus, the kitchenette also includes a microwave and coffee maker for those early mornings you’re headed to the theme parks! How many times do we visit the theme parks and are waiting in line for hours just so our kids can have a special character experience that lasts only a few seconds? Mom, raising both hands over here! Well, one of the special treats of staying at the Cabana Bay Beach Resort is that they offer nightly character experiences with some of your favorites like Marilyn Monroe and the Minions from Despicable Me. Best part? Oh, yes it gets better! There is no wait time, just walk right up! Plus, hang out with them for a while and let your kids have a unique character experience! My girls were infatuated with Marilyn Monroe and every night asked to go talk to her again! She definitely left an impression with my girls! 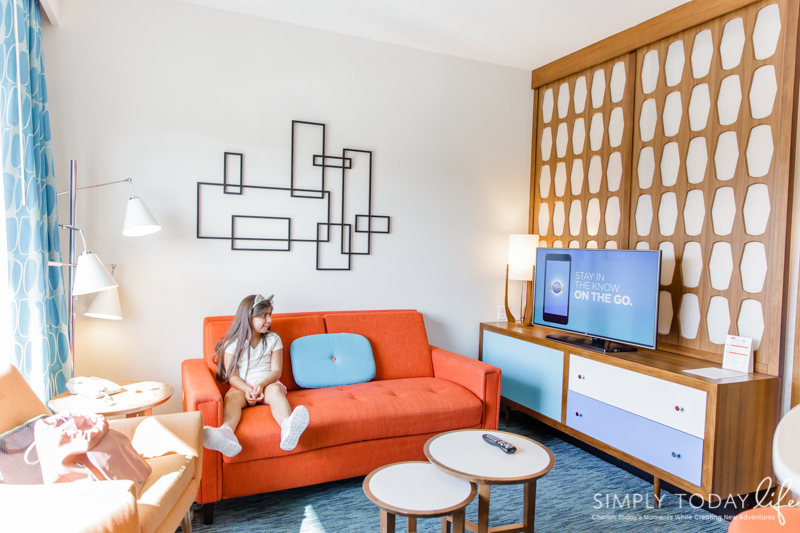 As Florida residents we are not too far from Cabana Bay Beach Resort, so we decided that it would be fun to pre-check into the hotel and enjoy some of the resorts amenities ahead of time! Yes, you can totally do this! I wished I would have allowed my girls to play in the fabulous pools, but my youngest was not feeling great so we stayed indoors instead. The good thing is that Cabana Bay has so many things to do, that even on a no pool day, we had the best time! We wandered around the resort and came across their Galaxy Bowl bowling plus a restaurant and Game O Rama arcade! 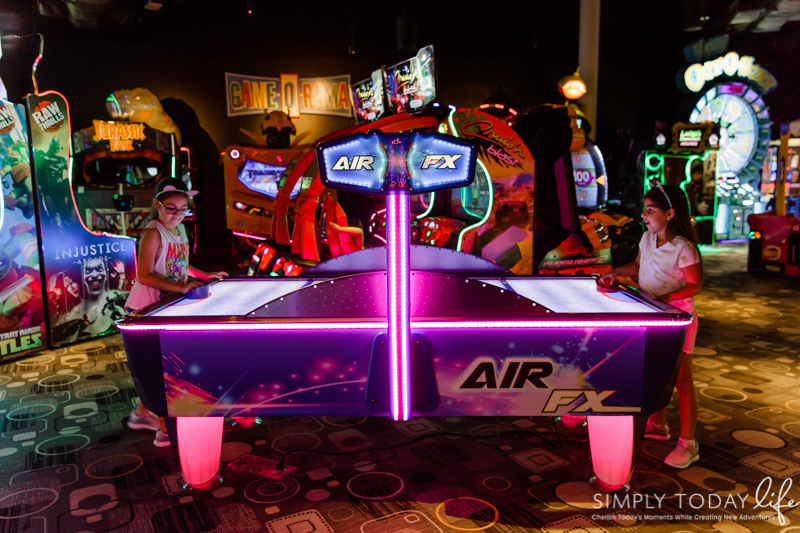 My girls are a huge fan of bowling, but they don’t get to play in an arcade very often so that’s what they decided to do. We spent two hours in the arcade playing around as a family while our room got ready. One of the most important aspects of a hotel is the pool area. Especially in the state of Florida where most of the time the weather is hot. I personally don’t love when resort pools get overcrowded taking all the fun away from relaxing. I love that Cabana Bay offers two different pools to choose from in the resort. Creating a more relaxed atmosphere because there’s more than plenty of room for everyone! We stayed in the Cabana Courtyard area facing the pool. This side of the resort has a large zero entry pool with a retro dive tower waterslide, interactive kids play area, cabanas for rent, and the Atomic Tonic poolside bar and grill. Although we didn’t rent a cabana this time around, we have in the past. It’s the perfect way to spend the entire day in the pool area. Each cabana includes a tv, WiFi, fan, fridge with bottled water, and a safe to keep your belongings in. There are also outdoor activities like Korn Hole, outdoor games, and a fire pit on chilly weather. A quick walk through the resort would take you over to the other end of the hotel where the Lazy River Courtyard is. This pool area features a zero-entry pool, a lazy river with waterfalls, and The Hideaway Bar and Grill. There’s also an area for you to purchase your own floaties for the lazy river, which also makes the perfect souvenir to take home! On this side of the resort, you are also able to walk right over Volcano Bay! This may not seem like a great amenity but I can assure you it is! We walked over in five minutes after we picked up breakfast at Bayliner Diner, and we walked right through security into the waterpark! 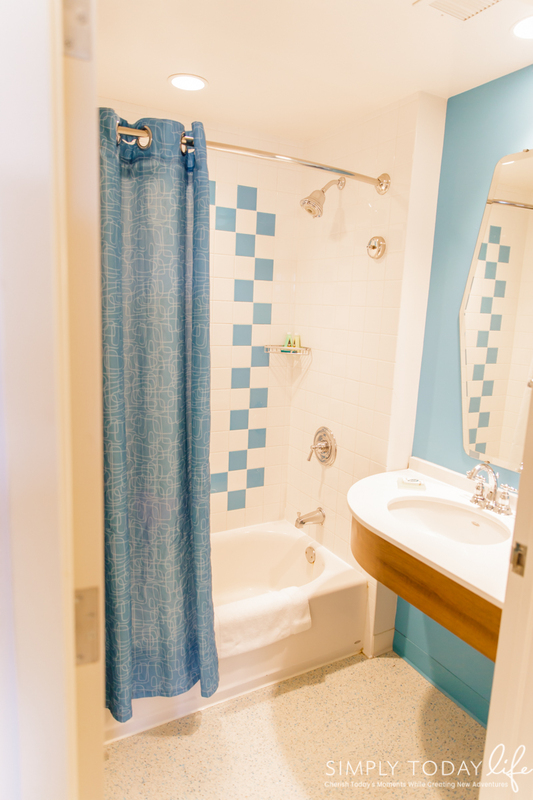 The Cabana Bay Beach Resort has everything that you can think you will need while staying on vacation in a hotel. From dining, shopping, and relaxing you don’t even need to leave! In fact, if you need to buy souvenirs for family members then head on over to the Universal Gift Shop or if you forgot to bring sunblock with you. Relax in their bright and retro lobby on comfy couches. 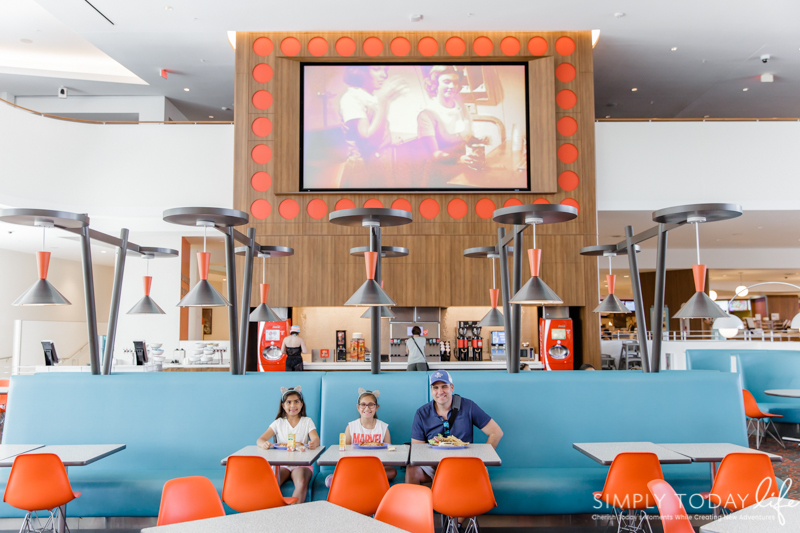 It’s the perfect spots for adults to enjoy a refreshment at the Swizzle Lounge while the kids meet with their favorite characters. Or pick up your Starbucks in the morning on the way to the theme parks! 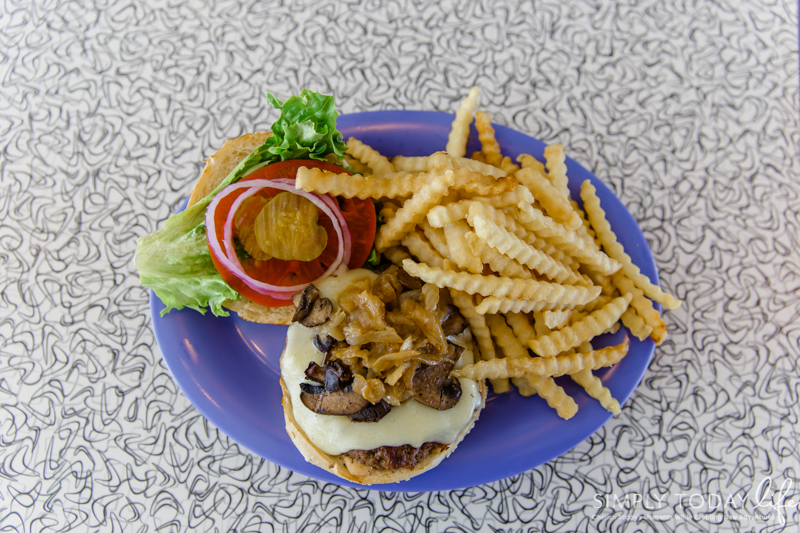 The Bayliner Diner is where you can find most of your meals fast and quick. They have several stations where you can choose different types of food from sandwiches, pizza, pasta dishes, and international dishes. You can choose to dine in the diner or take it to go! You can take your food back to your room, the pool area, and even Volcano Bay! We picked up breakfast one morning to go and ate it while staring at the beautiful Volcano Bay. I’m talking bacon, egg, and cheese croissant sandwiches! YUM! The Bayline Diner has plenty of seating all day long for large families and everything parents love! A nice spacious area, good fast food options, and a tv. My girls were in awe with the retro commercials being shown at the diner. It was a plus that they have several different choices for the kids to eat! Making it easy for my picky eater and my daughter who suffers from peanut allergies. Didn’t bring a car? No problem! Don’t want to drive your car to the parks and pay for parking? No problem! Universal’s Cabana Bay offers free bus transportation to all of the Universal Orlando Resort theme parks and City Walk. 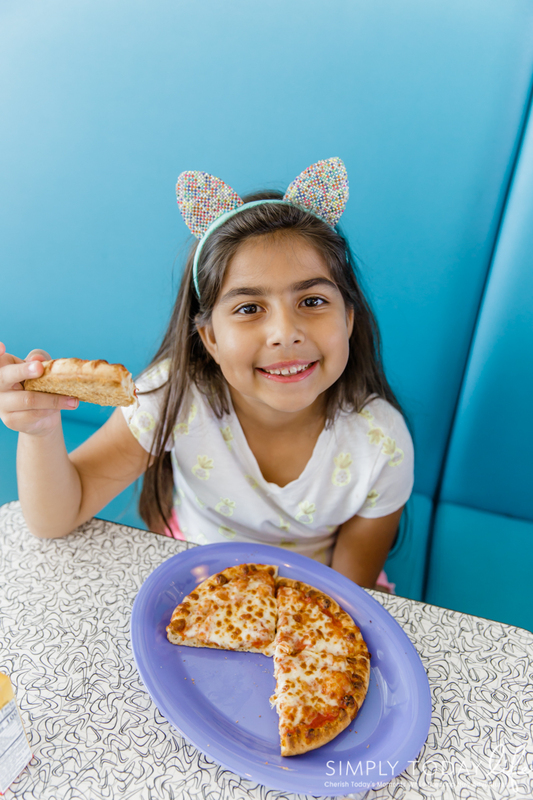 This made it easy for us to grab breakfast, coffee, and head on over to the theme parks. Plus, if you are all about getting to the theme parks early to avoid the long lines, then a huge perk of staying at Cabana Bay is that guests get early access to The Wizarding World of Harry Potter and Universal’s Volcano Bay. You can believe we took advantage of both of these! Heading to Universal Orlando Resort early in the morning is such a great way to see some of the most popular rides in the park! You are enjoying The Wizarding World of Harry Potter with other hotel guests, so the lines are minimal! This was my daughters first time visiting The Wizarding World of Harry Potter since reading all of the books and watching the movies. So it was a super special time we shared! It certainly was the best way to spend my 38th birthday celebration! Make sure to keep an eye out for a new post coming soon with all of the details of our visit to Universal Studios and Islands of Adventure! 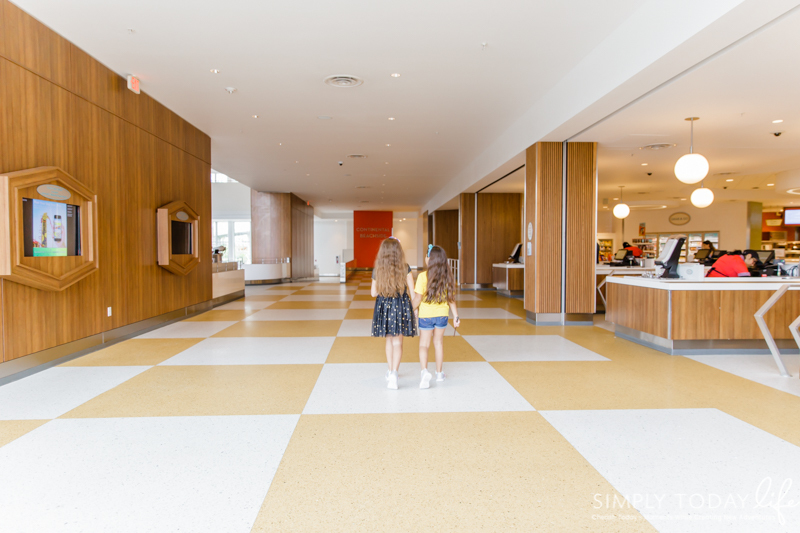 This wasn’t our first time staying at Universal’s Cabana Bay Resort or visiting Universal Orlando Resort, but it definitely was one of the best visits we have had! Now that my girls are older they are enjoying things in new ways and I just love watching their face light up with all the new experiences! The memories we made this weekend was one of the best we won’t forget! 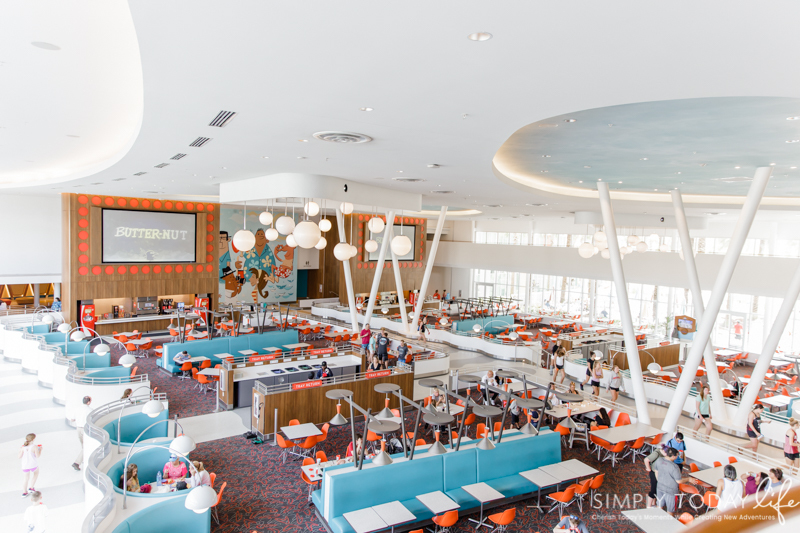 Have you visited Universal’s Cabana Bay Beach Resort?